I'm so excited to be playing along with the April release over at Neat & Tangled. The set being highlighted today is Have Courage stamps and coordinating dies. The main stamps are gingko leaves, but I did a floral twist on the watercoloring. First I embossed the image with gold powder. To get the gold highlights on the "flower", I used an embossing pen. Then I cut it out with the coordinating die. The circle cut out is backed with vellum for a softer look. 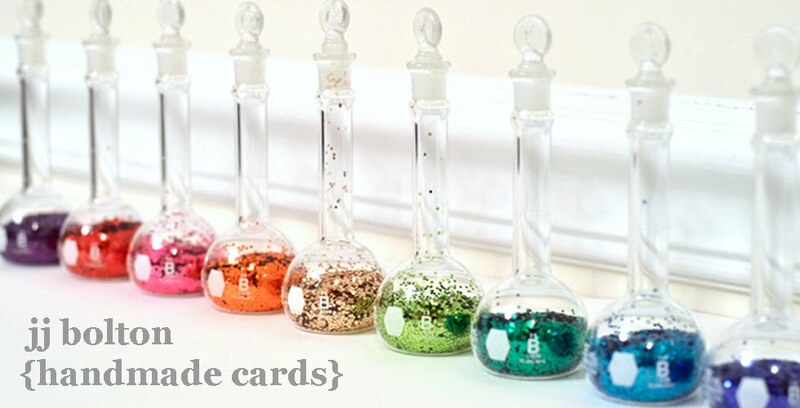 Head on over to the Neat & Tangled blog to check out more ideas with this set! This is such a great stamp that was created. But I think that you might have created the nicest card of all of the ladies. 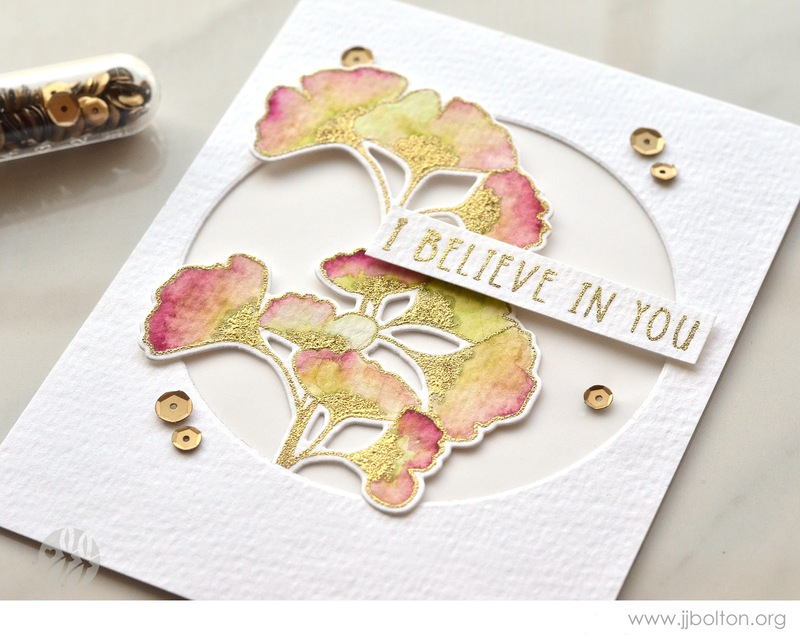 They are all amazing for different reasons, but your gold embossing, and coloring, wow---gorgeous! This is exquisite. I love what you have done with the set but I cannot find it on the website. I am also having trouble getting on the blog for the company. It must be heavy with graphics as my (original) iPad keeps shutting down when I try to open the page. I will have to fire up the laptop as I am intrigued. I went to college in Buffalo and there were gingko everywhere and they bring back some happy memories. I hope I can find this set. You truly have created a magnificent card. This is a stunning card! Thank you for sharing it!! This is so pretty JJ! i love the colors you chose and the extra embossing. That vellum behind the gingko is so smart too! So pretty. I like the touch of gold. So beautiful!! Love the gold embossing! Love your card. So pretty and unique. Oh my !! Your card is absolutely fantastic !! I love how you used your embossing pen on the flowers, JJ...such a lovely effect! 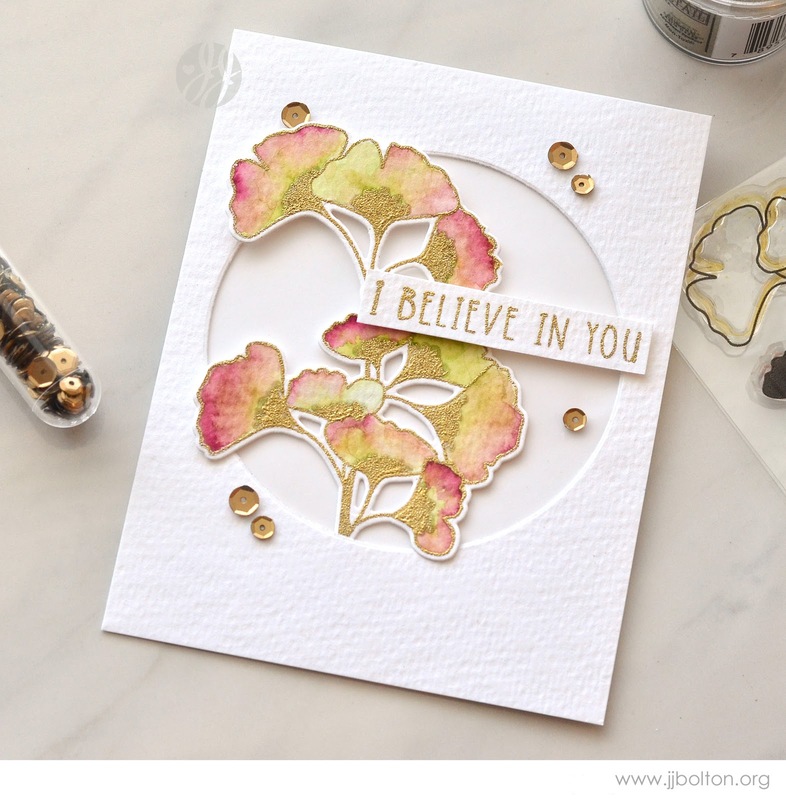 I also love that you chose vellum for the aperture and texture on your card base! Another gorgeous card!